At the time of writing I have a Deadzone Demo in two weeks. Therefore I had to paint a number of strike forces. 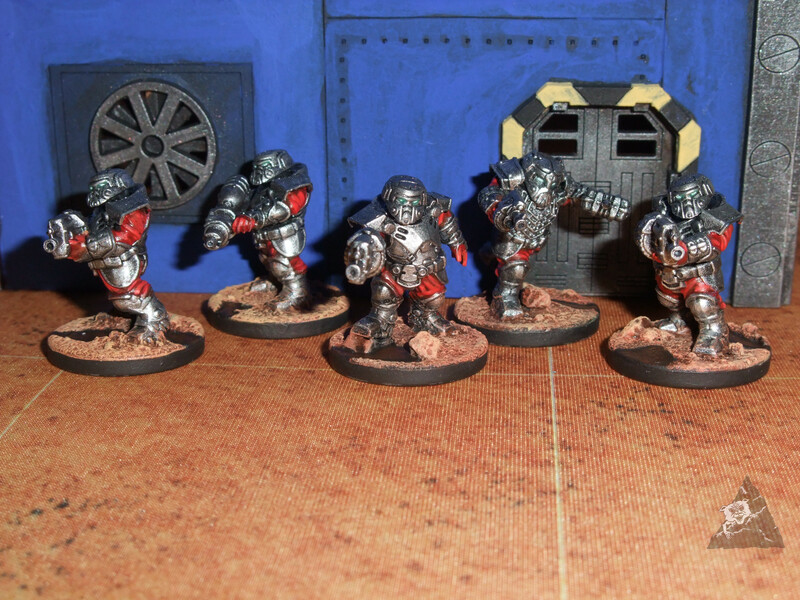 I have completed my Enforcers some time ago, and have planned on painting the Forge Fathers models too, but had no colour scheme. My original idea was that they were a group of volcanic world ore miners and started making lava bases. Since it is the Forge Fathers who made the Enforcer armour and the squads are called Steel Warriors, I thought it would make sense for the armour to be a similar colour. Going for an old school sci-fi vibe I thought the silver would be well off set by a deep red. Last minute however I changed my mind regarding the lava bases. A recent game of Deadzone using the Exham IV mat, combined with the fact they are supposed to be demo-miniatures meant that the bases are now Martian, with toxic sludge. I must say that Mantic has made some great miniatures here. The box comes with enough extra weapons to create either a standard Steel Warrior or Stormrage Veteran squad with heavy weapons and Huscarl ( Forge Father officer) upgrades. They were a pleasure to paint and I look forward to returning to this army when I expand it for Warpath.